If you're facing criminal charges for possession, possession for sale, trafficking, manufacture, transporting, sales, meth, marijuana, cocaine, ecstasy, rock cocaine, heroin, pills - Don't talk to the police first! 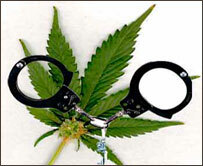 Talk to us - The Law Office of Mark A. McLaughlin, an experienced Northern California (Antioch, Pittsburg, Brentwood, Concord, Oakland, and San Francisco and ..) criminal defense lawyer with over 30 years experience with cases related to Drug Offences. You have the right not to talk to the police. If you think you're a suspect or you've been charged with a serious drug crime in state or federal courts, let us do the talking for you. Anything you say is likely to get you deeper into trouble, even if you're innocent - especially if you're innocent. Don't talk to police - Call us at (925) 754-2622 for a prompt response. Our aggressive, immediate representation pays off in successful results for our clients. If you're facing a drug charges that meet strike offense criteria or have prior drug sales convictions, let us negotiate with police and prosecutors on your behalf. Immediate intervention can show the prosecution that their case is weak, getting felony charges bumped down to misdemeanor charges or even getting the entire case rejected for prosecution. Do not let the police or prosecutor / DA control what happens. To learn more.. Call us at (925) 754-2622 for prompt response. If you are facing criminal drug charges, don't talk to the police first. Talk to us. For experienced, compassionate, reliable legal representation that gets results, contact My law office today by (925) 754-2622.